The Helios Collective has an amazing opportunity for composers (with a closing date of Saturday 20 June 2015). This coming November they are offering three composers the opportunity to create a 15-20 minute piece for flute, clarinet, violin, cello and piano and up to four voices. The works will be workshopped and developed with the aid of Kasper Holten (director of opera at The Royal Opera House), the conductor David Parry, Stephen Barlow (artistic director Buxton Festival) and Stephen Unwin (former artistic director of The Rose). They will also be providing direct contact with composers too to act as mentors. It will be a two week programme, the first working with a director and conductor to develop the works and the second in The Arts Theatre, Great Newport Street, London with the industry professionals. The event will conclude with a final performance on Friday 13th November in The Arts Theatre and a feedback session from the whole panel. 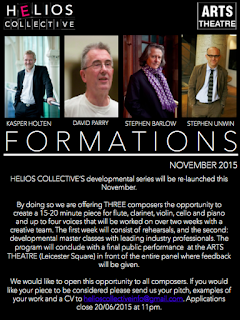 The opportunity is open to all composers, send your pitch, CV and samples of your work to helioscollectiveinfo@gmail.com by 11pm on 20 June 2015.